This deliverable examines the impact of the EU Eastern enlargement on wages, unemployment and other macroeconomic variables. 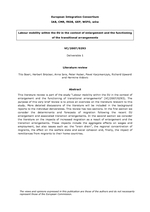 For this purpose we employ two general equilibrium models which both analyse the economic consequences of labour mobility in the context of the EU Eastern enlargement in a setting of imperfect labour markets. The first model is based on a nested production function, which enables us to examine the migration effects for the different cells of the labour market. The second model is based on a CGE-framework, which allows us to consider the links between labour migration, trade and international capital mobility. Moreover, it enables us to examine the sectoral implications of labour mobility in detail. Both models assume that capital stocks adjust to labour supply shocks at least in the long-run. We analyse the impact of Eastern enlargement during the years from 2004 to 2007 and compare it to the situation where no enlargement took place. We find remarkably similar results in both simulation models. The EU Eastern enlargement has only a moderate impact on labour markets. Especially in the long-run, labour mobility is neutral for wages in both the sending and the receiving countries and has only a negligible impact on the unemployment rate. Nevertheless our simulations suggest that increased labour mobility yields an aggregate gain in terms of GDP in the enlarged EU. Furthermore we examine the potential effects of introducing free movement in the enlarged EU. Based on our projections we contrast a prolongation of the migration restrictions until the end of the transitional periods with a scenario where we allow for free movement already at the beginning of 2009. Although the impact on the entire EU is rather small, single receiving countries are affected differently. This is because introducing free movement also changes the regional distribution of migration flows.